One of China’s top officials arrived in North Korea today, where he will join the celebrations for the 70th anniversary of the Korean Workers’ Party. The anniversary proper is October 10, but Liu Yunshan will spend four days in North Korea. Outside of anniversary events, Liu will hold official meetings with North Korean leaders. Liu is the first Politburo Standing Committee (PBSC) member to visit North Korea since Kim Jong-un assumed control of the country in 2011. China-North Korea ties have been icy since then, and particularly since Kim had his uncle, Jang Song-thaek, executed in 2013 (Jang was seen as China’s preferred interlocutor in the Kim regime). Beijing was also nonplussed by Pyongyang’s decision to go ahead with a nuclear test in February 2013, during China’s New Year holiday and just weeks before Xi Jinping officially assumed the presidency. Neither Xi nor Kim have visited each other’s countries since coming to power. The big question facing this visit is whether Liu will be accorded a meeting with Kim. The last high-ranking North Korean official to visit China, Choe Ryong-hae, attended China’s military parade in celebration of the 70th anniversary of the end of World War II. Beijing declined to say whether Choe was granted a private meeting with Xi; most sources (including China’s Global Times) agree Choe did not get such a meeting. However, South Korea’s Yonhap News predicted that Kim will meet with Liu, citing a diplomatic source. 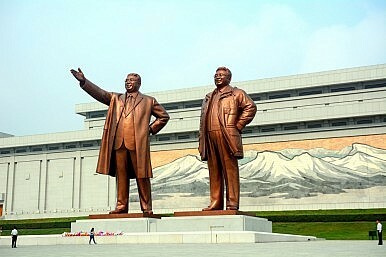 Yonhap also noted that in 2010, when China sent a PBSC member to North Korea for the KWP’s 65th anniversary celebrations, that envoy was granted a meeting with then-leader Kim Jong-il (ironically, it was Zhou Yongkang who made the 2010 visit; he has since been sentenced to life in prison on corruption charges). Hua emphasized that China and North Korea “are close neighbors” who maintain “friendly exchanges.” Liu’s visit “enables [the] high-level exchange of views on bilateral relations and issues of mutual concern, which will be conducive to consolidating and developing the traditional friendship and safeguarding regional peace and stability,” Hua said. Besides sending Liu to North Korea, China sent a congratulatory message from President Xi Jinping to Kim. According to Xinhua, “Xi, on behalf of the Central Committee of the CPC and in his own name, extended warm congratulations to Kim Jong-un and through him to the Central Committee of the WPK, all its members, and all people of the Democratic People’s Republic of Korea (DPRK).” Xi also praised North Korea’s “positive progress in developing the economy and improving people’s livelihood” under Kim Jong-un, and expressed optimism about China-North Korea ties. “China is willing to make joint efforts with the DPRK comrades to well maintain, consolidate, and develop the friendship between China and the DPRK,” Xi’s message said. Liu’s visit could potentially pave the way for renewed China-North Korea ties, although Beijing is still uneasy about the possibility of a North Korean satellite launch in the near future (concerns shared by South Korea and the United States, among others). However, it’s important to note that the relationship was never really stretched to the breaking point. In particular, economic cooperation continued apace even while political exchanges have been nearly nonexistent. In August 2015, for example, China announced a new, 1 billion RMB ($156 million) border trade zone with North Korea, centered on the Chinese city of Dandong. China also opened a high-speed rail line connecting Dandong with Shenyang, the capital of Liaoning Province, in a bid to “enhance China-DPRK transportation capability.” More recently, in late September China announced the opening of the first-ever bulk cargo and container shipping route linking Chinese and North Korean ports, with a focus on shipping North Korean coal to China and Chinese food products to North Korea.